Subsea technology companies, 2G Robotics Inc., and Sonardyne International Ltd, UK, announced they have entered into a formal collaboration agreement. The two organisations are working together on the development and promotion of a dynamic underwater laser mapping solution, which significantly reduces the time needed to survey seafloor sites and offshore structures. 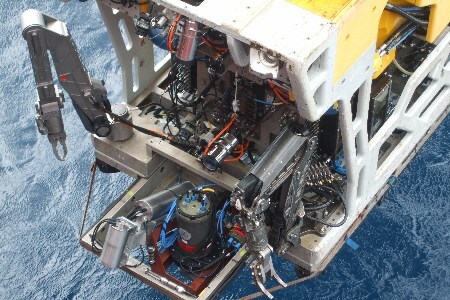 "2G Robotics and Sonardyne develop dynamic underwater laser mapping solution"
Until now, attempts at mapping from dynamic platforms have largely involved multibeam imaging sonars being fitted to remotely operated vehicles (ROVs), autonomous underwater vehicles (AUVs) and manned submersibles equipped with inertial, Doppler, acoustic positioning and depth instrumentation. As a result of their mobility, large areas can be quickly surveyed but this approach typically only achieves up to 10 cm relative accuracy – effectively ruling out applications like metrology which require centimetre or better accuracy. By adopting a dynamic platform such as an ROV navigated using SPRINT-Mapper, the high resolution laser data is no longer constrained by a stationary deployment location – this breakthrough in underwater mapping means an entire site can now be surveyed quickly and with the flexibility to overcome adverse conditions such as visibility. As the underwater vehicle does not have to come into contact with the seabed at the survey site, it can move to scan any target of interest from a variety of perspectives.